Last week, I excerpted part of the forthcoming women’s book (I swear, I’m getting there) about meal frequency and meal patterning and I want to go ahead and put up the second half of that chapter. This is really about more than just meal frequency and I go off on a bit of a tangent about weekly dieting schedules as well. So be it. At the most extreme of the above uneven distribution patterns is a relatively new approach called Intermittent Fasting or IF which basically refers to going longer without eating anything prior to breaking the fast. Once again, this doesn’t slow metabolism or cause starvation mode and one of the earliest studies that gave the day’s calories in a single meal actually showed a slight fat loss. There is a emerging evidence that this type of approach, or the use of occasionally longer fasting periods may have a number of health benefits as the light stress that this causes stimulates the body to improve various aspects of health (15). IF actually spans a number of different interpretations and I’ll look at them below. Related to the idea of IF’ing, which typically refers to a single day, there is a related idea called Alternate Day Fasting (ADF). This described a situation alternating an entire day of fasting (strictly speaking this is usually 25% of maintenance calories but it’s still called fasting) with the in-between days at maintenance or above. Generally folks end up eating about 10% more than normal but the overall effect is still a lowered weekly caloric intake. 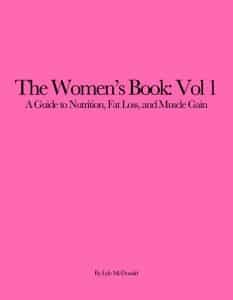 As I mentioned in a previous chapter, the body doesn’t really respond that quickly to lowered calories and alternating in this fashion might represent a superior away to generate a large weekly deficit (for fat loss) while avoiding some of the hormonal problems. And it might very well help the normally cycling woman to avoid the problems inherent to extended periods of low energy availability on menstrual cycle and hormonal function; this has not yet been studied but I don’t see why it wouldn’t have that effect. And so long as an ADF pattern doesn’t cause the free eating days to be massively over maintenance, this can cause the overall weekly deficit to either be larger or at least more or less identical to what would be seen with a straight reduction in calories. Related to ADF if a dietary approach that is being called Intermittent Caloric Restriction (ICR); this refers to alternating longer periods of fasting (again usually 25% of maintenance calories), perhaps 2-4 days with periods of normal eating. ICR has actually been found to cause the same fat loss as straight caloric restriction while sparing LBM loss (16). This is also effectively the same approach I described when I talked about how the normally cycling woman can avoid menstrual cycle and hormonal problems; by raising calories to maintenance every so often, the typical hormonal adaptations are reversed or at least lessened. In any case, dieting for a few days harder than normal and then raising calories might be superior in the long-term to a straight caloric restriction approach to fat loss for various reasons. It may spare LBM loss, avoid some of the normal metabolic adaptations, and could potentially improve adherence. Once again, it’s no different than my overall recommendation for dieters to raise calories to maintenance in the first place. But the key here is that the lower-calorie/harder diet days must be alternated with calories being raised to maintenance even slightly above. Many women are hesitant to do this and, in the long run, that causes the problems I’ve talked about previously. I’ve shown the different patterns that I described below to show how the weekly deficit can be the same or larger with the different approaches. IF’ing really just describes a different daily meal pattern and I’ll still assume the same weekly deficit. It can easily be combined with the ADF/ICR types of approaches. So even eating later in the day, calories could be varied from lowered/very low along with the shift in how the calories are distributed throughout the day. But you can see that the ADF/ICR approaches can actually generate a greater weekly deficit than straight CR. “Fasting” here means 25% of maintenance calories which may be too low in some cases if it means insufficient protein. “Ad-lib” just means eating “normally” (whatever that means) and researchers typically assume 110% of maintenance on those days. If calories are kept at 100% maintenance, the effective deficit for IF, ADF and ICR will be even higher. It’s important to realize that ICR has only been tested in obese, non-exercising individuals and some modifications (primarily higher calories on the fasting days) would have to be made. The more athletic approaches to IF’ing generally revolve around 3 meals that are clustered around an evening workout. So a small meal might be eaten an hour or two before the workout, calories being eaten immediately after training, and then a fairly large dinner meal. The single meal IF approach is not really appropriate here. Make no mistake that IF is not magic for fat loss. Calories still have to be tracked and those seeking fat loss still have to create a daily deficit. Athletic IF approaches tend to be ideal for trainees who work out in the evening (and they may be wholly inappropriate for performance athletes who train more than once per day). It is more difficult to apply this for dieters who work out in the morning since it typically means eating earlier in the day and having to contend with night-time without food. It can be done but it’s more difficult, most of the food is clustered earlier in the day which still leaves a potentially problematic evening time in terms of hunger, sleep, etc. As well, since IF’ing is really more of a meal distribution pattern, it can be further combined with an ADF/ICR type of approach. Years ago I described what became known as an Every Other Day or EOD dieting pattern where calories were higher on heavy training days and lower on easier or low-intensity training days. For a Monday/Wednesday/Friday training pattern, calories would be set a lower level (50% of maintenance, an aggressive deficit) on Tuesday/Thursday/Saturday/Sunday with more calories on training days. Since carbohydrates will have to be reduced fairly significantly, the low calorie days might be nothing more than proteins, some vegetables with a small amount of fruit and dietary fat. Carbohydrates and calories would be increased on training days. So far as ICR, my own Ultimate Diet 2.0 actually used exactly this pattern (a decade before it was studied) where calories were set at 50% maintenance for nearly 4.5 days (generating rapid fat loss) followed by 2.5 days of higher calories. It was aimed at Category 1 dieters and allowed many to either maintain or even gain some LBM while dieting and some women dieted down without a loss of their menstrual cycle. Even for Category 2 and 3 dieters, I have recommended periods of higher calories/carbohydrates (termed refeeds) for years. Even performance athletes who are doing different types or amounts of training may benefit from this type of dietary strategy, putting more calories on harder training days and reducing them on the lower intensity days; the deficit wouldn’t be as large on training days here. Just adjusting their caloric and nutrient intake based on the day’s actual energy expenditure. High-intensity performance athletes often have very hard training days with sprints and weight training alternated with lower intensity days. As well, those athletes seeking gains in muscle mass or strength/power could use this type of approach without much if any deficit. Calories would be set slightly above maintenance, 10% above is more than sufficient with calories at maintenance or slightly below maintenance on easier training days. This can help to avoid the fat gain that can occur during gaining phases without hampering overall recovery or adaptation. Perhaps the easiest way to do this is to set up the baseline diet to be used on non-training days (using the math from the last chapter) and then add calories on training days with around workout nutrition to match the workout. So a performance athlete burning an extra 300 calories on heavier training days just needs to add that around a workout to support training. This is one huge benefit trained athletes have over everyone else; their ability to burn a lot of calories during workouts allows them more total food intake overall. Once again, the EOD and ICR approaches almost match the weekly deficit of the straight CR approach with a far different pattern of caloric intake and a less stringent diet. Once again this improves recovery and training performance on those days while still generating fat loss and potentially avoiding menstrual cycle and other hormonal dysfunction that happens with straight dieting. The EOD approach for gaining generates an effectively insignificant deficit but it doesn’t generate the surpluses that can often lead to fat gain either. Now, a number of fairly silly arguments have been made against IF’ing for women, typically revolving around the single meal per day approaches. For female athletes or even who are involved in any type of heavy resistance training, I do not recommend that approach and the type of athletic IF application I described above would be more appropriate. At the same time, some women do find that extended fasts, past about 14 hours can cause their blood sugar to become unstable causing mood and energy problems (and this is especially true during the luteal phase. A slightly shorter fast of hours and the inclusion of some fruit at the first meal goes a long way towards preventing this. So a woman who ate her last meal at 8pm might break her fast with a small meal at 2pm. It doesn’t have to be large and could be followed with another small meal at 4 or 5pm for an evening workout. Calories would be eaten after workout and then a larger dinner meal would be appropriate. On 2000 calories per day, a snack of 300 calories at 2pm, another snack of 300 calories at 5pm, 200 calories after training leaves 1200 calories for dinner time. Which might even be excessive and more could be put in either the 2pm or 4pm meal. As calories drop lower, this can be even more useful. On 1600 calories, for example, the same meal pattern would leave 800 calories at dinner time (or even 600 calories for dinner and a 200 calorie pre-bedtime snack to stave off nighttime hunger and help with sleep). IF’ing can be a powerful strategy here. I’d also add that there is one population that I think should not use IF’ing (despite it’s proponents, typically men, thinking that it’s the solution to all problems) and that is any female with a previous eating disorder (bulimia moreso than anorexia but both can be problematic) or even those with a tendency towards disordered eating patterns. In this situation, IF’ing, ADF or ICR types of patterns can put them right back into the type of purge/binge cycles that they had in the first place. It turns into a starve all day (or every other day) alternated with a complete loss of food control. Even dieters not coming from that background often find that they lose total food control in the evenings when they fast even part of the day. Starting the first meal with protein and fiber can help with this but it can still cause problems. This is a very individual type of thing with no absolutes. Whether for athletic applications or the general public, I’d suggest trying IF’ing (or any other dieting approach) at most three times and if it simply doesn’t work, it should be abandoned. A straight caloric restriction approach with calories being raised to maintenance every so often may be the superior approach here. I’ve covered a lot of information in this chapter and I understand if it’s a bit overwhelming. Just remember that there is no single meal pattern or approach to calorie distribution that is optimal for all situations or all people. There is an element of experimentation here to determine what is best for any one person. But to put the above in a more comparable fashion, I want to show how calories might be distributed through the day for the different meal patterns I showed above. Our sample dieter is on 2000 calories and this will represent her luteal phase diet of 140 grams of protein, 132 grams of carbohydrate and 90 grams of fat per day but the same ideas hold for the follicular phase diet. I’ll assume relatively typical meal times of 8am, 12pm, 4pm with a 6pm workout. These are just examples of course. And I’ll compare an even distribution with the addition of post-workout protein and carbohydrates. I’ll also show a more evening distribution of calories with 40% of the day’s calories at bedtime and the rest distributed evenly and then an athletic IF approach. The notation for each meal is calories on the top and then protein/carbohydrates/fat in grams underneath it. *Rather than being at 4pm, women should break the fast earlier at 2-3pm to avoid potential blood sugar issues. This meal should contain some fruit to help with blood sugar regulation. And the above only scratches the surface. A small bedtime snack could be added which would reduce calories from the other meals and keep in mind that the above are only goal ranges. If one meal has slightly more or less protein, carbohydrate or fat, another meal can have slightly more. So long as the overall day’s diet adheres to the follicular or luteal phase guidelines in a broad sense, minor variations are not relevant. And to wrap up this chapter, I want to examine a question that I doubt most have even considered. 15. Rothschild J et. al. Time-restricted feeding and risk of metabolic disease: a review of human and animal studies. Nutr Rev. 2014 May;72(5):308-18. 16. Varady KA Intermittent versus daily calorie restriction: which diet regimen is more effective for weight loss? Obes Rev. 2011 Jul;12(7):e593-601. 17. Davidsen L et. al. Impact of the menstrual cycle on determinants of energy balance: a putative role in weight loss attempts. Int J Obes (Lond). 2007 Dec;31(12):1777-85. And that concludes the discussion of meal frequency and meal patterning. Editing on the book grinds along, I’m about 2/3rds of the way through it and it’ll be finished when it’s finished. Trust me, everyone will know when it’s done.